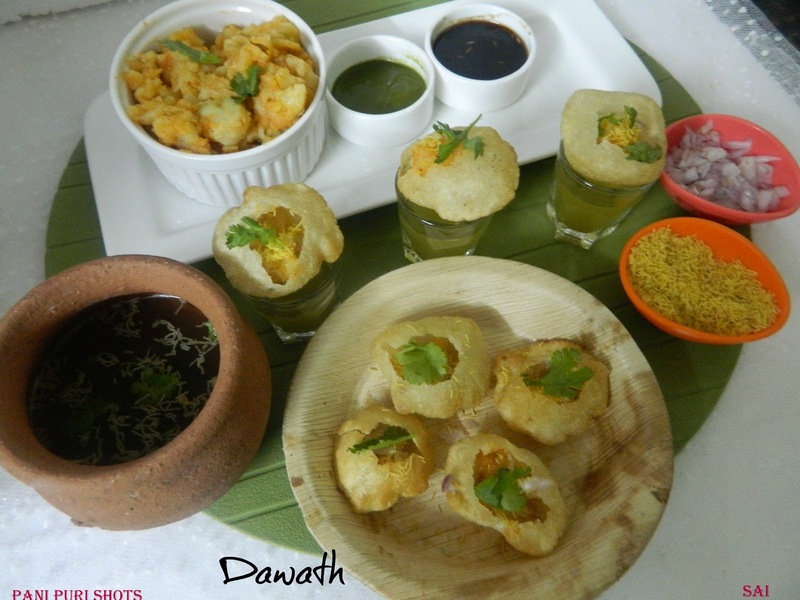 Pani puri or gol gappe,popular chaat of India…so many names but yet taste is divine.In India ,they are called by different names in different parts of the continent. Pani comes from the Hindi word for water,that is Mint water here and puri is deep fried Indian bread.There s a typical way to eat this yummy chat.We have to place one full puri in the mouth and eat at one shot,only then you can enjoy its taste.Initially we used to prepare home made puris,but now it is easily available in most of the stores.I still remember the time when I used to have Pani puri when I would visit Mumbai and just go on eating one after the other served by the pani puriwallah. 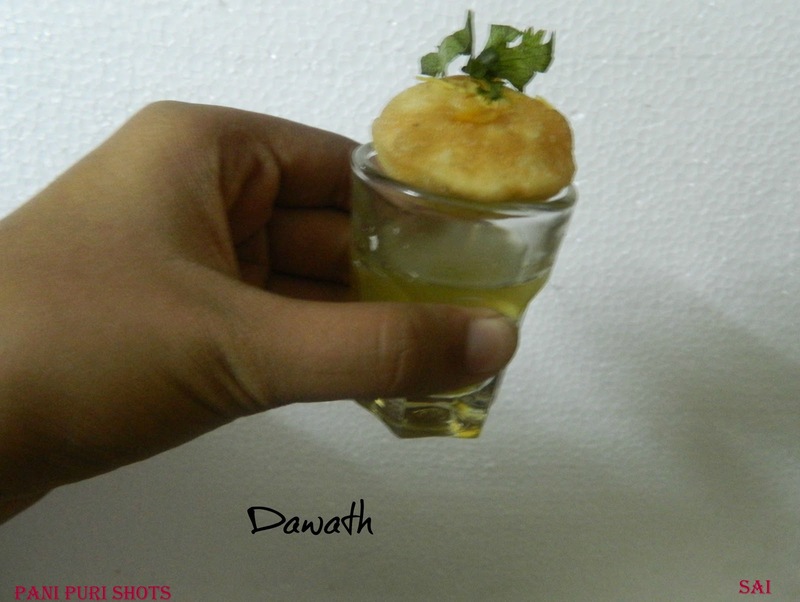 Pani puriwallah is the person whom we refer to who prepares this delightful chaat. Lol, not to forget to mention have also fallen sick after having the street food.But now being health conscious I prefer home made ones,which is the best one.Coming back to the recipe I have used boiled potatoes as a filling here,but you may also use sprouted green gram,green peas etc as the filling. 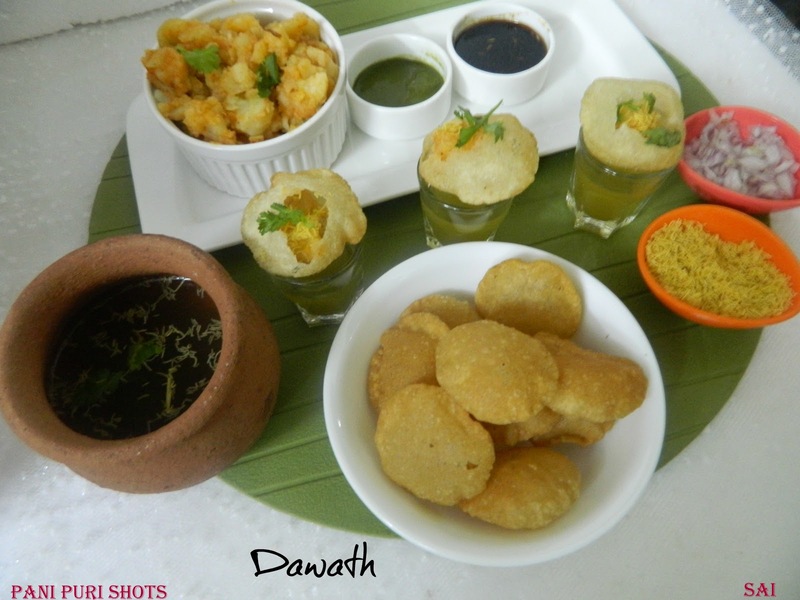 I adapted few parts of the recipe from Tarla dalal’s book.Since we have this yummy chat in one shot I have named the dish as Pani puri shots. Soak the tamarind in ½ cup of water for approximately 1 hour,strain out all the pulp through a sieve. Combine this pulp with the remaining ingredients except the black salt in a blender and grind to a fine paste using a little water. Transfer the paste into a large bowl and combine with 1 litre of water, the black salt and salt mix well. Grind together mint leaves,coriander leaves and green chillies into a fine paste using little water. Transfer the paste into a large bowl and combine 1 Lt water,salt,sugar and lime juice. Strain the water if you desire and chill it for few hours and serve. Crack a small hole in the centre of each puri. Fill with a little potato mixture or sprouts or boondi, then top a little khajur imli ki chutney and Green chutney immerse it in the chilled pani and eat immediately. Combine the semolina, plain flour, soda water and salt make a semi-stiff dough and knead well,allow it to rest under a wet muslin cloth for 10 to 15 mins. Divide the dough into 40 equal portions and roll each portion in 37 mm ( ½ “) circles. Place these circles under a damp cloth for about 5 minutes. Remove, drain on absorbent paper and store in an air-tight container. I used the ready made puris. I follow second method for pani and keep the pani lil sweet. You may adjust he measurements as you want. 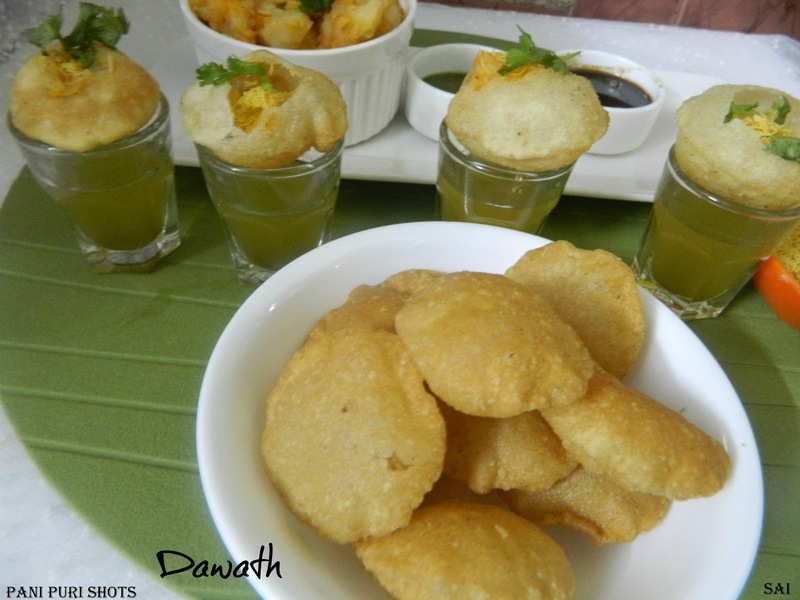 You may also cut the puris with the help of a small lid if you are preparing puris.